For over a century St. Croix campers have paddled some of the most gorgeous waterways in North America. It’s a tradition we carry on to this day. Our Frontiers campers learn the basics of canoe tripping before they spend two nights camping on the Lower St. Croix River; for most of those campers it is their first time traveling by canoe. 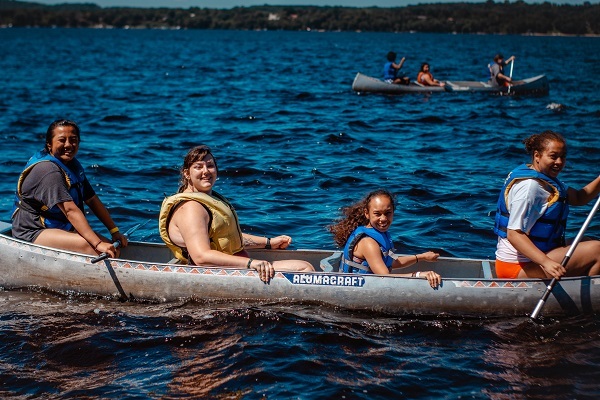 Our Voyageur campers review paddling skills at Camp, then head north to the Boundary Waters Canoe Area Wilderness with their St. Croix counselor. There they take part in a five day wilderness expedition with logistics and guiding facilitated by our sister camp, YMCA Camp Menogyn. Our wilderness canoeing focused Leadership Development Program, titled Explorers, brings campers deeper still into the wilderness. In partnership with YMCA Camp Menogyn. Master paddling and portaging skills before heading out on multi-week paddling trips in Minnesota’s Boundary Waters.